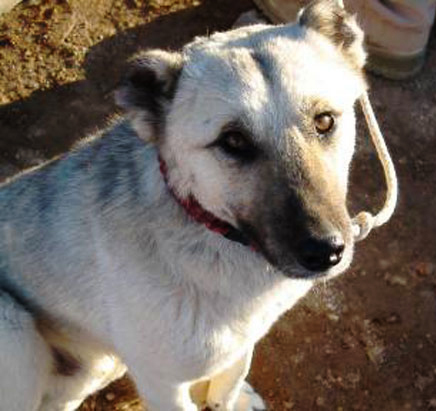 Nubs is an Iraqi dog who had a rough start in life. He was used as a fighting dog, was badly abused, and ran in a pack of dogs in Al Anbar Province. Nubs’ ears were cut off to make him look tough and to make fights last longer since there is almost no ear left to be injured. (The same thing is done to US dogs used for fighting.) Things started looking up though for Nubs when he was rescued by Marine Major Brian Dennis. Major Dennis took care of Nubs for 4 months. Then the Marine was ordered to move his squadron and had to leave Nubs behind. Two days later and 70 miles away, Nubs appeared at the squadron’s new location. Nubs had tracked the squadron for 70 miles across desert in 18 degree weather while injured. Dennis continued to care for him until he was informed that the dog had to go or it would be shot. Major Dennis didn’t let this remarkable dog down. He got Nubs into Jordan, found a family there to care for him, and will be transporting Nubs to the US. What a lucky dog and what a compassionate human! Don’t miss the video of Nub’s story. I love this story. What does this say about the Iraquis though. Does anyone doubt why we need to be there? What would the Iraquis do to us? Lovely story. Thanks. We in the US don’t have to look very far to see the same sorts of things. Dog fighting is a big problem in the US. And “ear cropping” is just a nice way of saying you’re cutting off a dog’s ears. Glass houses, throwing stones, and all that. Hello fellow dog lovers, my name is Heather and I am part of the Bring NUBS to America clan. NUBS is in great hands now, Brian has made sure of that. 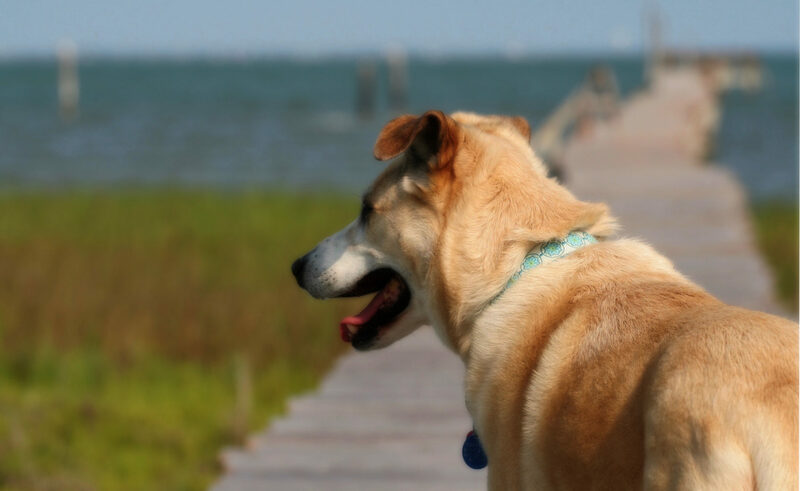 There is a certified trainer set up to help NUBS transition to his King of the Beach status and a backbone of amazing NUBS and Brain supporters that are going to make sure NUBS is taken care of until the two can be reunited. I am sure you will see follow up once the two are together again as the media is hounding for follow up stories. I did want to let everyone know as I am combing the net that Brian is NOT raising anymore money for NUBS so please do not listen to anyone who says they are collecting for the cause. They are scammers and in my mind are bad people trying to take advantage of a nice story. Brian really appreciates all the offers but he has told us all that NUBS is his dog and his responsibility and will take care of the rest of the financial needs for NUBS. I can not put words in Brian’s mouth but if you still feel the need to donate I am sure your local Humane Society or Animal Prevention Organization would appreciate any donations made in honor of NUBS. Otherwise your good thoughts sent to the two soul mates is enough I am sure. I was looking to see if more money was required for Nubs, and apparently that’s been taken care of. So please just let the Major know he is my hero and his actions have not only warmed my heart – they demonstrate on an international level the very best that America can muster. MBA, JD, former CPT USA JAGC, and 28 years in animal rescue. Major Dennis is a fine man. Dogs are amazing creatures. Some strays recognize love & kindness in a human immediately. Others take longer. Once that happens, a dog only wants to, has to be with that person. It’s fitting and admirable that Major Dennis did anything necessary to get Nubs to San Diego and reward that quality and love. And also admirable that his family and friends helped financially. Wishing the Major a safe return home, a great long life to both he & Nubs. Lost Dog Blues, a song I wrote about this subject & people like Major Dennis , can be heard on Rhapsody, iTunes,Tradebit, etc. Artist: Larry Thurston. CD title: School For Fools. Lost Dog Blues. Levon Helm, from The Band, is the drummer. Major Dennis, I salute you. That’s no slight to our soldiers nor Major Dennis. But “soldiers” are in the United States Army. “Marines” are, well, Marines. They work really well together, but the Marines are in the Department of the Navy. I was so overwhelmed by the love of this man for his best friend. Thank you so much major. Your story touched the hearts of my family as well as we are all animal lovers. Glad to see that you are reunited with Nubs. Hooray for Brian and Nubs! I am touched by reading about this loving, hardy dog. What a heart warming story. They ARE the most amazing companion a person could have. Total unconditional love. They do not care how much $ you make, what kind of day you have had, how bad u look. They just want show love and be loved. Now he will be a real citizen dog of the good ol’ U.S. OF A. 🙁 They were our best friends EVER & I still cry that we lost 3 in such a short period & I know my husband misses his Maggie as they went everywhere together as I know Major Brian Dennis will be that special person to Nubs! The story is truly a testament that if you show a dog compassion & love, their loyalty to their persons knows no bounds as they do have like 200,000 more smell sensors than humans?! (meaning the time Major Dennis showed this poor dog what all dogs need, love, kindness, etc.I know that’s why Nubs found him!! I almost cried my eyes out at work when I read this story. My pitbull did something similar. My mother’s house went into forclosure and I have to find a place for me and my dog. I moved in with my boyfriend who also owns a pitbull. A week after my dog hadn’t seen my family since we moved. It was a friday, my sister-in-law wanted to take her out for a walk because she seem aggitated. I was sone of those rainy weeks,very ugly outside. When I received a call at work that my dogs had run away. I was devastated! Didn’t know what to do! So I called my boyfriend and he advised me to go to the old house. I didn’t think I was a good idea at all. Well, crying my eyes out and with the animal control on my cellphone, arrived to the house…there she was, sucking wet…. Scratching the door…my Rage Jr. Sat down on the wet pavement…crying my heart out like I have never done it before. She is faithful to me and my family, I will be faithful to her. Hope you like my story. This story is great, and I’m so glad he’s safe now! Did anyone else find it cool that Nub’s tapped into some kind of 6th sense to track his new master? Maybe this has other tracking applications, especially for soldiers? Perhaps it isn’t the best idea to forbid dogs in warzones, when they are capable of tracking 70-miles in 2 days with FRIGGIN ESP. Training and practical application seem in order. “Julie” is an idiot. The people of Iraq dont HAVE to shudder and imagine “what we’d do to them” because we’re DOING it. This is an incomparable act of human kindness, canine devotion and visceral love. Rare combinations. I wish Major Dennis and Nubs a long and happy life together.